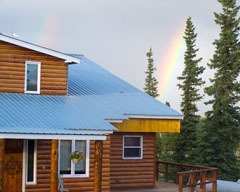 Welcome to Evergreen Lodge – we offer warm hospitality in comfortable and peaceful surroundings. Evergreen has been on Lake Louise for over 50 years and takes great pride in providing good care for our guests, many of whom have been coming back year after year. Our rooms are spacious and light with private baths. In the morning a Continental Breakfast is available. Most of our windows overlook the lake and offer great viewing opportunities for wildlife and, when it’s dark, the aurora borealis. 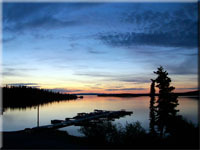 Activities to choose from include fishing for lake trout, arctic grayling and white fish, walking on trails and road, good bike riding (bring your own bike) and for the photographer, this area offers a variety of wildlife like trumpeter swans, numerous species of ducks and birds, bald eagles, moose, caribou and occasionally fox, bear and wolf. Or you may want to simply relax, catch up on your reading and at the end of the day, watch one of our spectacular sunsets. For our Alaskan guests, we have the best marina on the lake with a deep water launch, docking space, boat storage and provide gas and propane to our boat customers. Bring your own boat and Lake Louise will capture you time and again. For area cabin and land owners we offer barge services which can haul substantial loads to your property.